Do you experience challenges with the process of window washing around your home or business premise? Your efforts are not enough to wipe stains, water streaks and dust build-ups from glass surfaces? 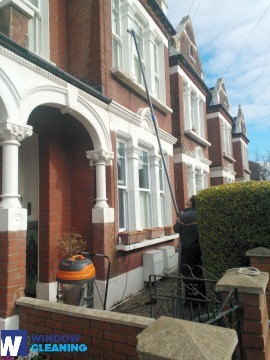 The specialists of window cleaning in Palmers Green will help you out! Say goodbye to the countless hours of polishing and wiping – the skilled and experienced team members will handle this problem. You will be able to make the most of your extra time – just let us do this time-consuming and exhausting task for you. Our professional approach will grant you lots of bonuses. We also provide our professional services in nearby areas: Bowes Park, Southgate, Grange Park, Winchmore Hill, Osidge. We use advanced methods of window cleaning to ensure you will have superb end results. With our water fed pole system, high pressure cleaning and rope access team, you can be sure that your property's windows will be crystal clear. In addition, your house is in good hands – the cleaners are completely insured and thoroughly trained. Our water fed extension poles are connected to water supply vans, while our rope access ensures safety – even when we clean high-rise buildings. You can get advantage from these methods immediately – dial 020 3746 3113! You can depend on the cleaners for both household and business window cleaning. Every type of glass surfaces are included in our professional routine. For instance, you can request a service for cleaning small or double windows, French doors, sash windows, patio doors and bay windows. Besides these, we wipe and polish garden window surfaces, conservatories and skylights. At home or at your workplace, you can always get crystal clear glass – just call us! We have the skills and the right equipment for the job. You can rest assured that the good look of your office building is granted. The experts will provide you with second-to-none commercial window cleaning. With the help of our water-fed extension pole system, you will receive fast and splendid washing of all windows up to the fourth floor. For high-rise buildings, we employ our rope access tools. It is our efficient technique of reaching glass panes on taller structures. Regardless of what is the size of your property – a humble corner shop or the Shard – we will leave a pristine look of your windows. You will have absolutely clean home after the best window cleaners in Palmers Green deal with this task. We deliver the best services for the entire London locality. The most modern methods are included in our working procedures – including water-fed extension pole system and and jet washing. You will see for sure the change of your home's entire look – we use purified water for the process of inside and out window washing. Give us a call now on 020 3746 3113. Our customer service representatives will help you and answer your inquiries. In addition, you can use our on-site booking from.